This is the one you’ve all been asking for. 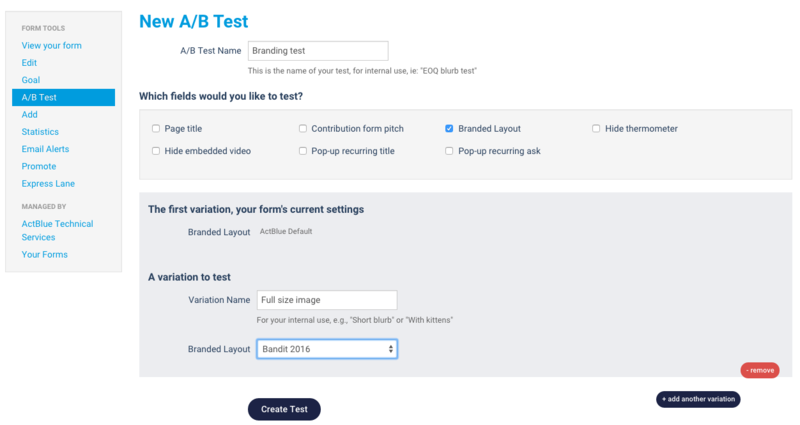 We just added the ability to A/B test your brandings! 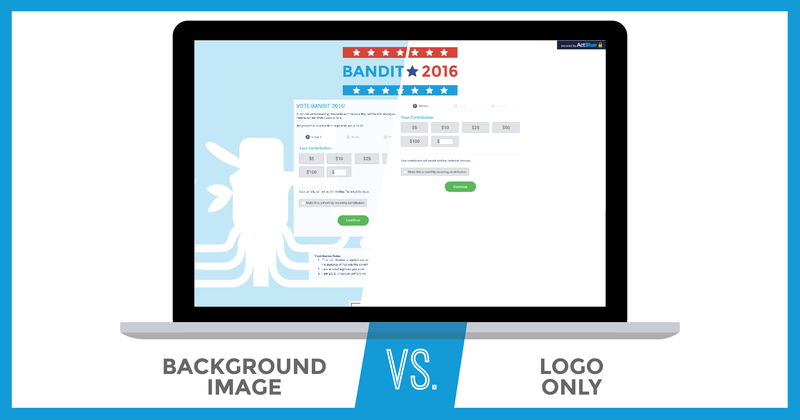 Now there’s no need to guess whether a giant photo of your candidate or a simple branding will fare better. And with our awesome multi-armed bandit A/B testing suite, you’ll get results as fast as possible. To set up a branding test, create or open up a contribution form. Navigate to the A/B test tab and give your test a name. Next, check off “Branded layout.” Your first variation will be the branding your form is currently set to (or your default branding). You can choose your variation to test from the dropdown menu. 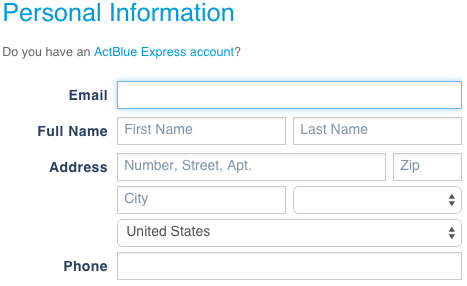 You can also test having no branding by selecting “ActBlue default.” If you need a refresher on creating a branding, check out our guide. Once you’ve made your selection, click “Create test.” You can monitor the results of your test once you start sending it out to donors. Unlike a regular A/B test, our multi-armed bandit system of A/B testing will start sending more traffic to the winning version of the test as results come in, so you’ll get results faster and won’t lose money on a subpar variation. And there’s no need to pick a winner — the multi-armed bandit will take care of it for you! If you have questions about setting up a beautiful branding or an A/B test, let us know at info@actblue.com. 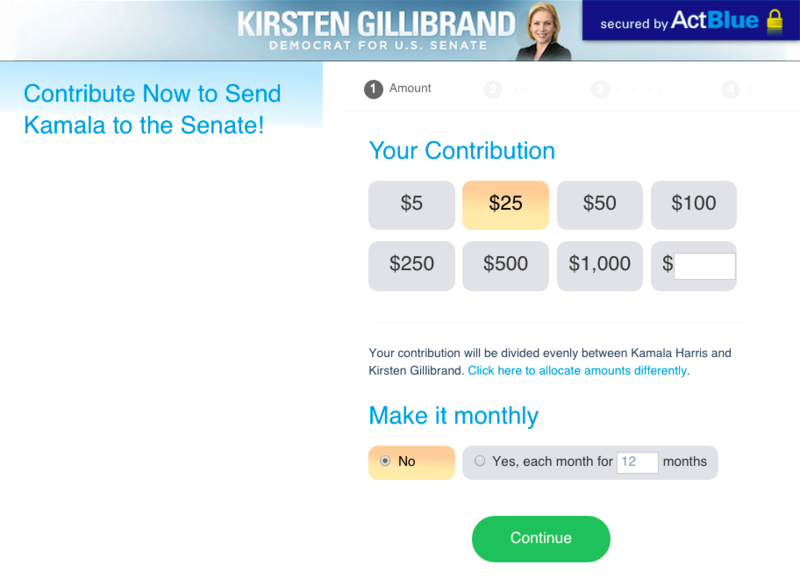 Here at ActBlue, we’re always optimizing our contribution form by testing different variations against each other to see which performs best. And, whenever possible, we like to share our results. 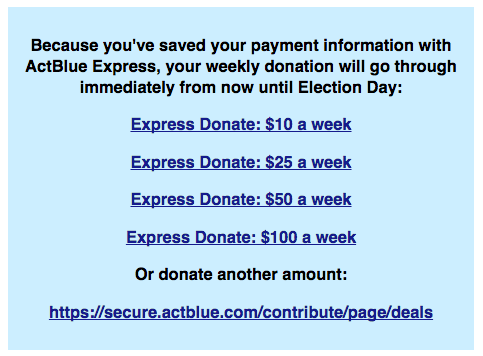 Needless to say, it’s great to discuss tests that end up winning; every percentage point increase in conversion rate we bring to our contribution form benefits every committee — of which there are currently over 11,000 active — that fundraises on ActBlue. The control version, it turns out, was actually associated with a higher conversion rate than the “Full name” variation, though not statistically significantly.1 We even tested another slight variation of the “Full name” field with slightly different placeholder text and a more expressive label, but it lost again. If you’re wondering why it lost, then that makes two of us; in a case like this, it’s tough to say what actually happened. Was it aesthetics? Anti-novelty effect? If we speculate like this ad infinitum, we’ll end up with more questions than answers — the world is full of uncertainty, after all. Far from discouraging this type of reflection, I’m saying that we indeed should! This is the origin story of many new testing ideas. Our team is always thinking through ways to make our contribution forms easier to fill out and more streamlined. When donors have too many options and abandon a form, that’s known as choice paralysis. Eliminating that choice paralysis is a big part of building better contribution forms. Too many options and too many boxes for our liking. Do you want to give more to candidate A than organization B? How much do you want to give in total? We boiled the form down to that last question — how much do you want to give? 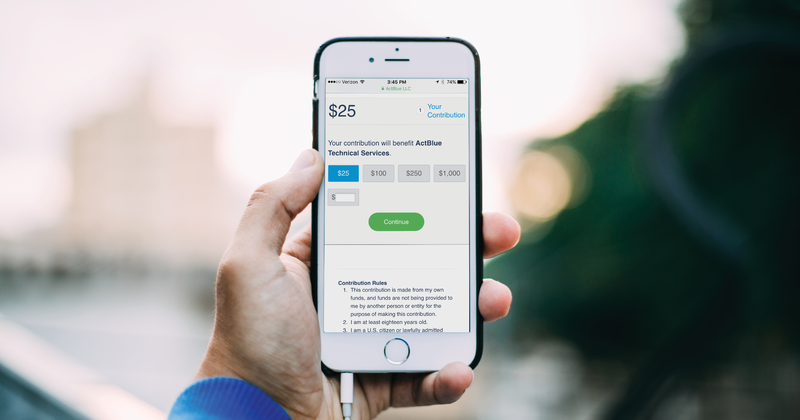 This made it a lot easier for donors to give (spoiler alert: this A/B test was a huge success). 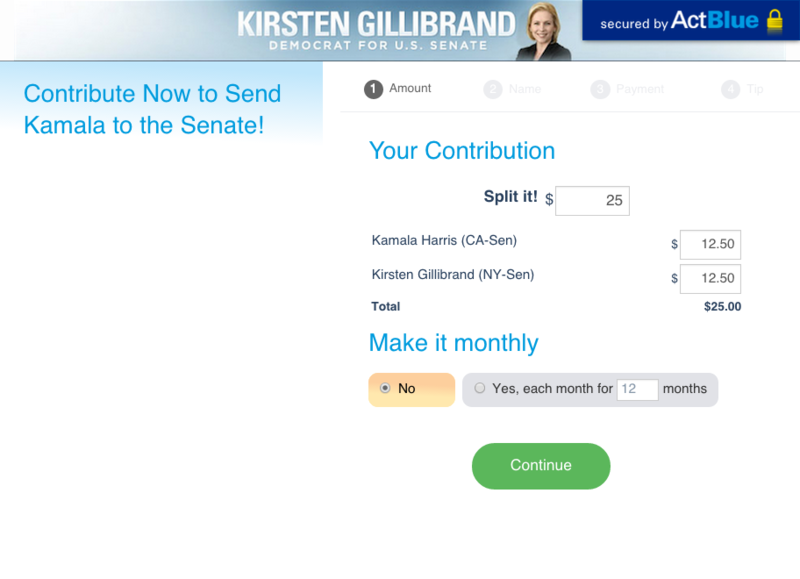 Now, when you land on a tandem form, you’ll see the normal amount buttons with a note underneath saying who the donation will be split among. 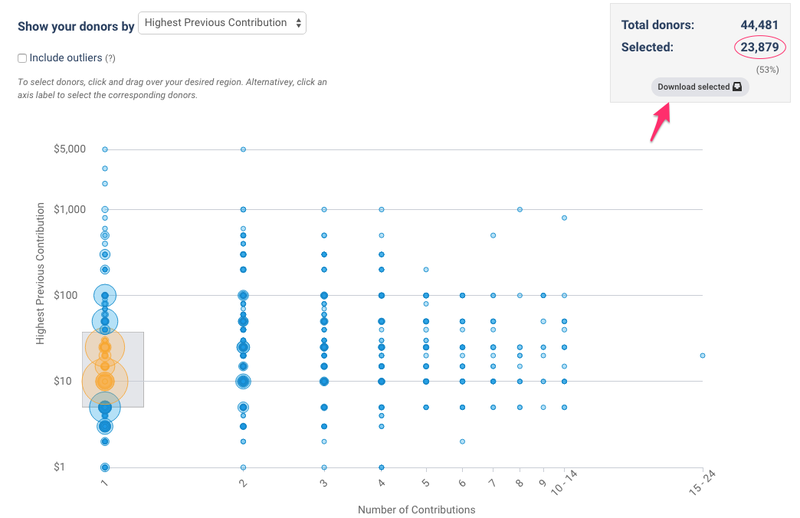 You can still click a button to allocate different amounts to each candidate, but donors are less overwhelmed when they land on the page. So how successful was our A/B test? We saw a 7.16% overall improvement in conversion. That’s unheard-of-huge. We’ve done so many optimizations of our forms that we cheer for a test that leads to a 0.5% increase in conversions. Part of that overall group consisted of non-Express users (people who haven’t saved their payment information with us) who land on our traditional multi-step form. Among that group we saw a 26% improvement in getting people to move from the first step of the process (choosing an amount to give) to the second step (entering their information). There are so many candidates and organizations running really thoughtful tandem fundraising campaigns, and this is going to mean a huge bump for them. If you have questions, or want to tell us about a tandem campaign you’ve run, let us know at info AT actblue DOT com. We want to hear from you! Weekly recurring is back baby! We’re less than 8 weeks out from Election Day and are now making the weekly recurring feature available to campaigns and organizations. 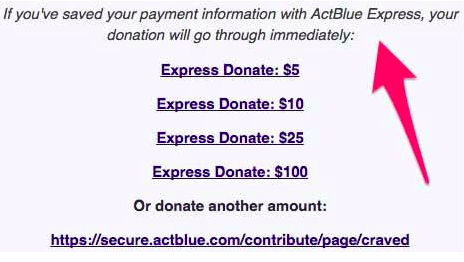 Just drop us a line at info [AT] actblue [DOT] com and we’ll turn it on for you. Yep, weekly recurring is exactly what it sounds like. 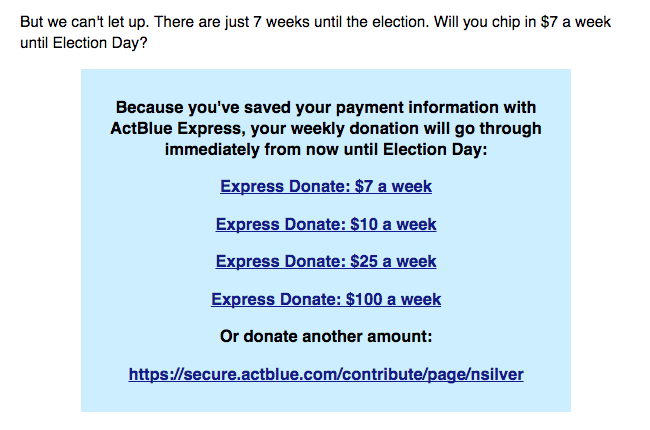 You can ask your donors to sign up to make a recurring contribution that processes on that same day of the week every week until Election Day. 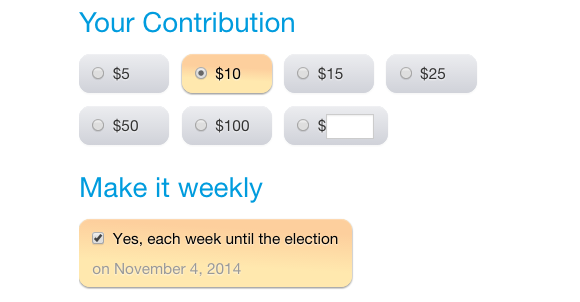 After Election Day, the recurring contribution automatically ends. So, if you get someone to sign up today for a weekly recurring contribution, they’d then have 7 more contributions scheduled to process every Friday. Election Day is getting closer and closer though, so if you’re going to use weekly recurring, we suggest getting started soon. Once we turn on the feature for you, create a new contribution form and open the “Show recurring options” section in the edit tab. You will see a new option there for weekly recurring. Make sure you also turn off popup recurring if you have it enabled — these two features aren’t compatible (yet!). Based on our testing, certain segments of your list will respond better than others to a weekly recurring ask (not exactly a shocking revelation). We sort our list into those likely to give to a recurring ask and those who are more likely to give a one-time gift. For the recurring pool, the weekly ask has been performing strongly. Unsurprisingly, the same can’t be said for our one-time folks. Test it out with the portion of your list that is more likely to give recurring gifts. And try fun things like offering a small package of swag like bumper stickers in return for signing up for a weekly recurring gift. And if you find an angle that’s working really well for weekly recurring, let us know! This post is the third in our blog series on testing for digital organizers. Today I’ll be talking a bit about what an A/B test is and explain how to determine the sample size (definition below) you’ll need to conduct one. Hey, pop quiz! Is 15% greater than 14%? My answer is “well, kind of.” To see what I mean, let’s look at an example. Let’s say you have two elevators, and one person at a time enters each elevator for a ride. After 100 people ride each elevator, you find that 15 people sneezed in elevator 1, and 14 people sneezed in elevator 2. Clearly, a higher percentage of people sneezed in elevator 1 than elevator 2, but can you conclude with any certainty that elevator 1 is more likely to induce sneezing in its passengers? Or, perhaps, was the difference simply due to random chance? In this contrived example, you could make a pretty good case for random chance just with common sense, but the real world is ambiguous so decisions can be trickier. Fortunately, some basic statistical methods can help us make these judgments. One specific type of test for determining differences in proportions1 is commonly called an A/B test. I’ll give a simple overview of the concepts involved and include a technical appendix for instructions on how to perform the procedures I discuss. Let’s recall what we already said: we can perform a statistical test to help us detect a difference (or lack thereof) between the action rate in two samples. So, what’s involved? I’ll skip over the nitty-gritty statistics of this, but it’s generally true that as the number of trials2 increases, it becomes easier to tell whether the difference (if there’s any difference at all) between the two variations’ proportions is likely to be real, or just due to random chance. Or, slightly more accurately, as the number of trials increases, smaller differences between the variations can be more reliably detected. 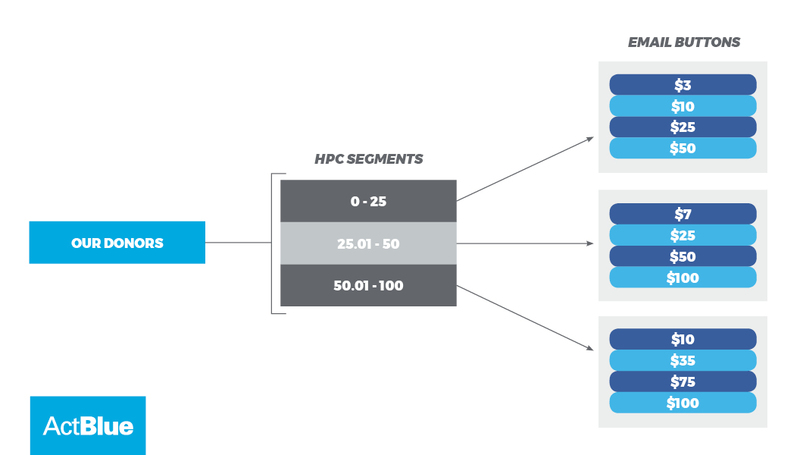 What I’m describing is actually something you’ve probably already heard about: sample size. For example, if we have two versions of language on our contribution form, how many people do we need to have land on each variation of the contribution form to reliably detect a difference (and, consequently, decide which version is statistically “better” to use going forward)? That number is the sample size. To determine the number of people you’ll need, there are a few closely related concepts (which I explain in the appendix), but for now, we’ll keep it simple. 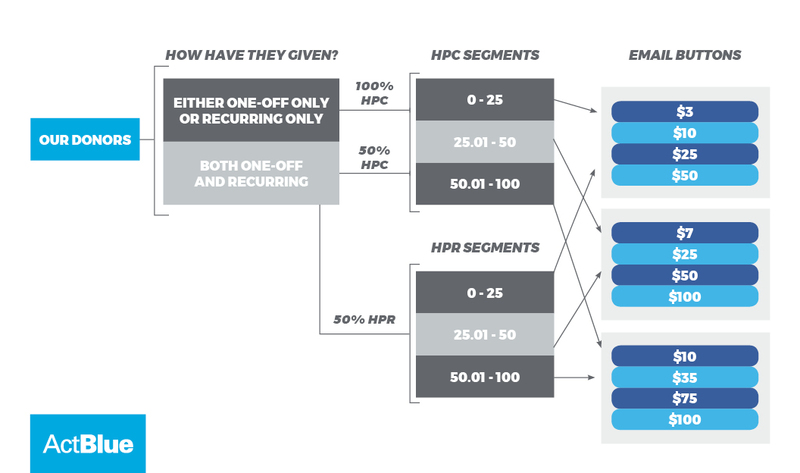 The basic idea is that as the percent difference between variations you wish to reliably detect decreases, the sample size you’ll need increases. So, if you want to detect a relatively small (say, 5%) difference between two variations, you’ll need a larger sample size than if you wanted to be able to detect a 10% difference. How do you know the percent difference you’d like to be able to detect? Well, a good rule of thumb to start with is that if it’s a really important change (like, say, changing the signup flow on your website), you’d want to be able to detect really small changes, whereas for something less important, you’d be satisfied with a somewhat larger change (and therefore less costly test). Required sample size varies by the base action rate and percent difference you want to be able to reliably detect. Notice the trends: as either of those factors increases, holding all else equal, the sample size decreases. 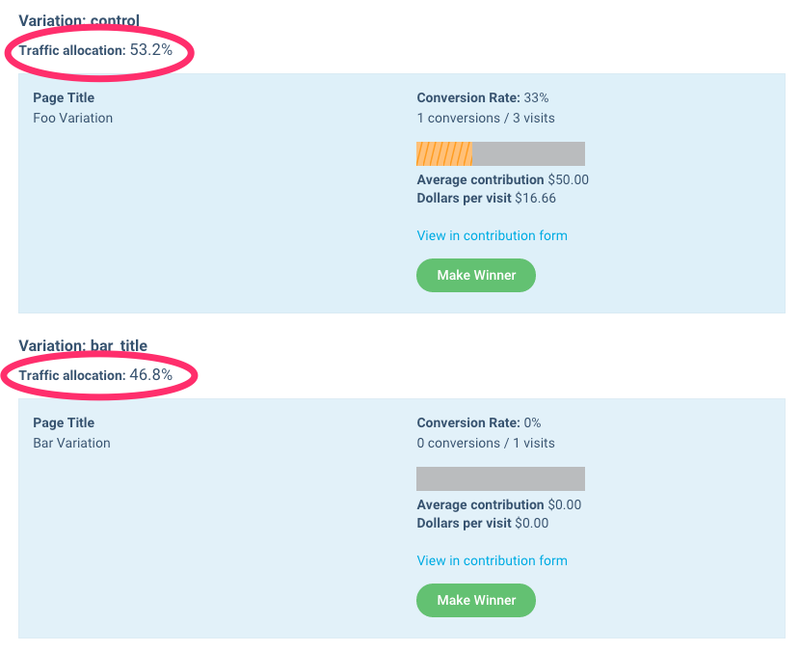 For example, if you’re testing two versions of your contribution form language to see which has a higher conversion rate, your typical conversion rate is 20%, and you want to be able to detect a difference of around 5%, you’d need about 26k people in each group . For instructions on how to find that number, see the appendix below. Once you have determined your required sample size, you’ll be ready to set up your groups and variations, run the test, and evaluate the results of your test. Each of those will be upcoming posts in this series. 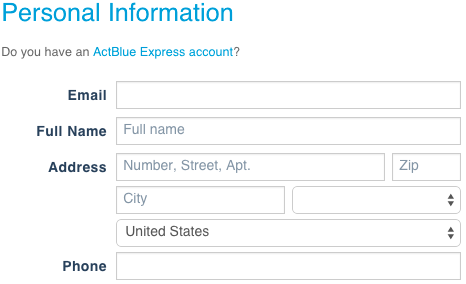 For now, feel free to email info [at] actblue [dot] com with any questions! 1 Note that this should be taken strictly as “proportions”. 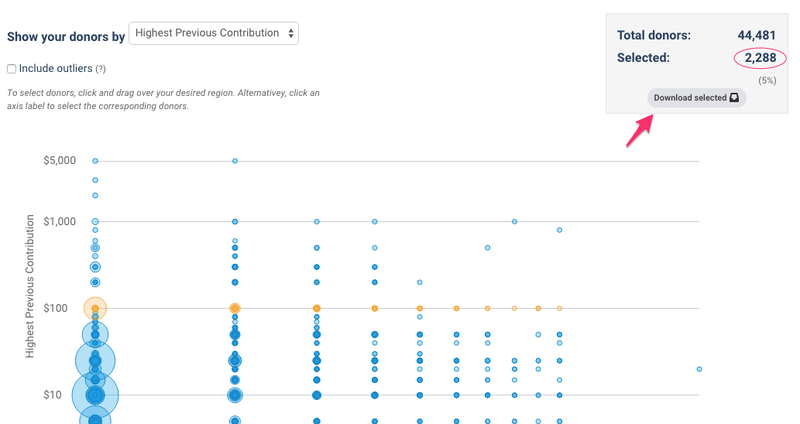 Of course, there are many things to be interested in other than the percentage of people who did an action vs. didn’t (e.g., donated vs. didn’t donate), like values of actions (e.g., contribution amounts), but for now, we’ll stick to the former. 2I.e., the number of times something happens. 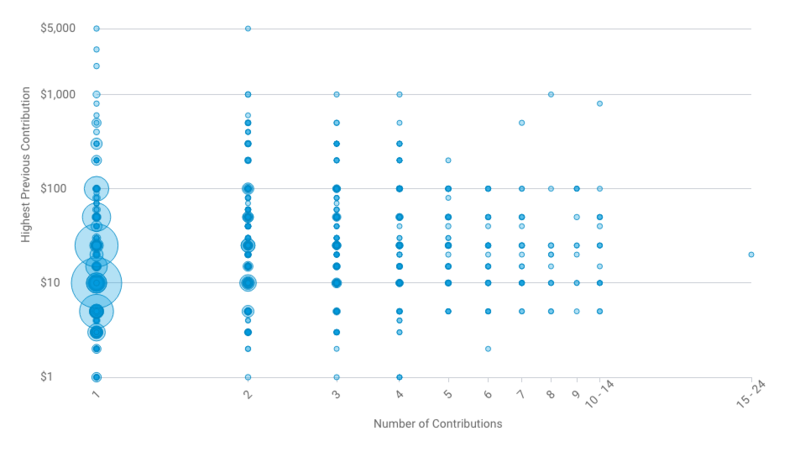 For example, this could be the number of times someone reaches a contribution form. Statistics is a big and sometimes complicated world, so I won’t explain this in too much detail. There are many classes and books that will dive into the specifics, but I want you to have a working knowledge of a few important concepts you’ll need to complete an accurate A/B test. I’m going to outline four closely related concepts necessary for determining your sample size, and walk through how to find this number. Even though I’m sticking to the basics, this section will be a bit on the technical side of things. Feel free to shoot an email our way with any questions; I’m more than happy to answer any and all. Like I said, there are four closely related concepts when it comes to this type of statistical test: significance level, power, effect size, and sample size. I’ll talk about each of these in turn, and while I do, remember that our goal is to determine whether we can reject the assumption that the two versions are equal (or, in layman’s terms, figure out that there is a real statistical difference between the two versions). Significance level can be thought of as the (hopefully small) likelihood of a false positive. Specifically, the probability that you falsely reject the assumption that the two versions are equal (i.e., claim that one version is actually better than the other, even if it’s not.) When you hear someone talk about a p-value, they’re referencing this concept. The most commonly used significance level is 0.05, which is akin to saying “there’s a 5% chance that I claim a real difference, but there’s actually not”. Power is the the probability that you’ll avoid a false negative. Or said another way, the probability that if there’s a real difference there, you’ll detect it. The standard value to use for this is 0.8, meaning there is an 80% chance you’ll detect it; though there are really good reasons for adjusting this value. 0.8 is by no means always the best value to choose for power; it’s generally a good idea to change it if you know exactly why you’re doing what you’re doing. .08 will work for our purposes, though. Why not just pick a value of .9999, which is similar to saying “if there’s a real difference, there’s a 99.99% chance that I’ll detect it”? Well, that would be nice, but as you increase this value, the sample size required increases. And sample size is likely to be the limiting factor for an organization with a small (say, fewer -than-100k-member) list. Effect Size. Of the two versions you’re testing against each other, typically you’d call one the ‘control’ and the other the ‘treatment’, so we’ll use those terms. 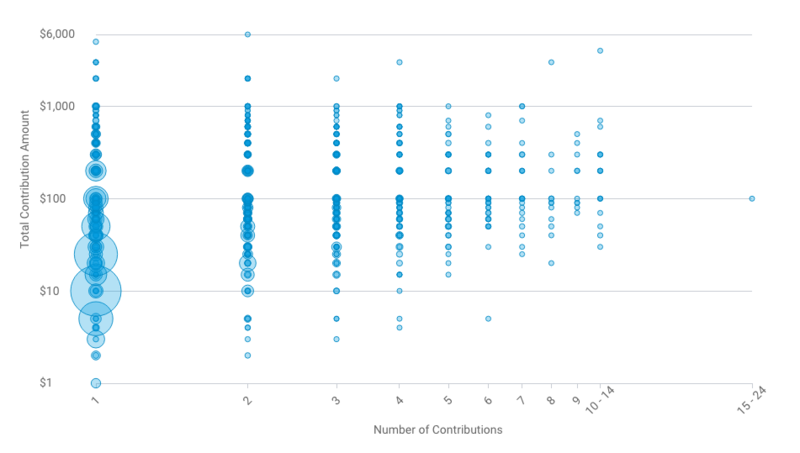 Effect size is saying, what do you expect the proportion of actions (e.g., contributions) to be for the control, and what do you expect it to be for the treatment? The percent difference is the effect size. How this affects sample size is demonstrated in the above graph. But the whole point of running this test is that you don’t know what the two proportions will be in advance, so how can you pick those values? Well, actually, you estimate what your base action rate will be. 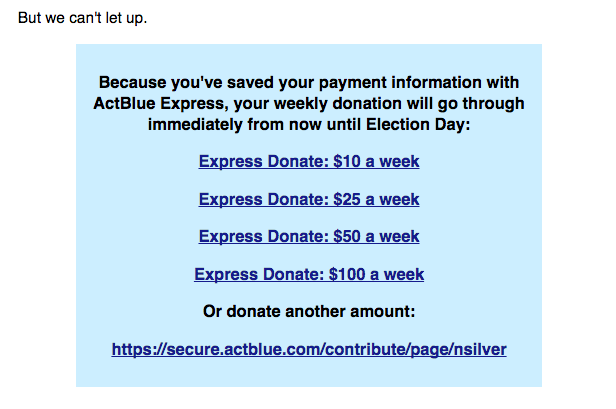 For example, if your donation rate from an email is typically 5%, then you can use that as your base action rate. Then, for the second proportion, pick the smallest difference you’d like to be able to detect. Similarly to power, you might find yourself asking “well why wouldn’t I just pick the smallest possible difference?”. Again, the answer is that as you decrease the magnitude of the difference, the sample size you need will increase. Finally, we have sample size, or the number of people we need to run the test on. If we have values for the above three things, we can figure out how big of a sample we need! So how do we do that? Well, there are many ways to do it, but one of the easiest, best, and most accessible is R. It’s free, open-source, and has an excellent community for support (which really helps as you’re learning). Some might ask, “well that has a relatively high learning curve, doesn’t it? And, isn’t there some easier way to do this?” The answer to both of those questions is “maybe,” but I’ll give you everything you need in this blog post. There are also online calculators of varying quality that you can use, but R is really your best bet, no matter your tech level. Of course, your base action rate will likely be different, as will be the percent difference you’d like to be able to detect. So, substitute those values in, and you’re all set! Playing around with different values for these can help you gain a more intuitive sense of what happens to the required sample size as you alter certain factors.